A risk management hack in a single tool. A precision tool you can use for tight scalping techniques. Here are the details of what it can do for you. If you intend to trade with Stop-Loss. It puts a Stop-Loss automatically if open trades or pending orders don't have one. So in case you forgot to set your Stop-Loss, this tool is to the rescue and will do it for you. If you intend to counter-trade, this tool can give a precise position to trail your Buy-Stop and Sell-Stop so you can catch the best price for counter trading. To minimize the risk some traders have been using a trail stop technique to put the Stop-Loss of the trade to a breakeven price level once the trade becomes in favor to its position. This tool has the save feature that will automatically manage your trail-stop and make it to continously move from breakeven to an increasing profit as long as the price still moves in favor to your trade position. Open any currency pair chart at any timeframe. Be sure that the "Autotrade' button in the menu is in running mode or in green color. From the Expert tab in the Navigation Window, load this tool. 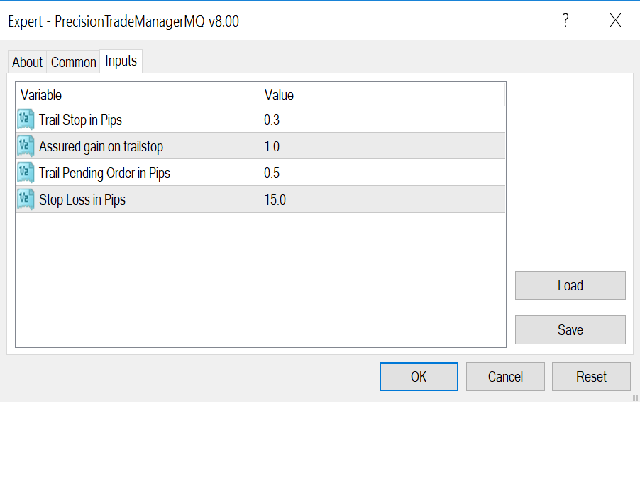 You can use the default parameter values if you are into tight scalping or you ca opt to change it according to your scalping needs. When it is already running, you can start now to analyze for your trade entries or you can use the Entry Plan indicated in the WildScalpingIndicator that you can also see in MQL5 Market Site. Here is the link: https://www.mql5.com/en/market/product/37008. Trail Stop in Pips = 0.3 The value of this plus the "Assured gain on trailstop" parameter will activate the Trail-Stop of the open order. Assured gain on trailstop = 1.0 The definite profit in pips once the Trail-Stop is activated. Trail Pending Order in Pips = 0.5 The Buy-Stop or Sell-Stop will move close to the current price as it moves. This make it catches the right position to open the pending order when the price reverses. Stop Loss in Pips = 15.0 This will automatically make sure that a Stop-Loss is created for all open trades with the number of pips indicated in the parameter. Best result when use with currency pairs only. May be bad for commodities and cryptocurrencies.